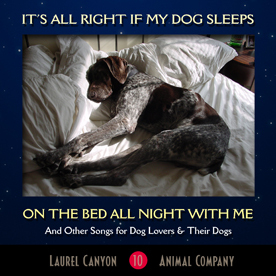 Wow, all of us dogs here at WNR were introduced to some new sounds the other day when we listened to the pet friendly music produced by Laurel Canyon Animal Company’s new release. Our favorite song , of course, woof, woof is “It’s All Right” , howl we agree and love to sing along ”It’s All Right with Me if the Dog wants to sleep on the bed all night with me! “ Now, that’s our kind of song! Their song “Squeaky Deakey” is a great one to play on the way to the dog park! There are 6 songs on the new album, two songs for dog lovers and the other four for dogs! What a great gift idea for us on our birthdays! They also have a Holiday song album we would love at Christmas, hint hint. Woof! Don’t worry cats! There is an album for you and your parents too, called, “Cat-A-Tonic” How cool is that? Best of all, they support The American Human Society and Animal Rescue. Be sure at stop by their website any ole time to listen to samples and pick out a CD for the animal love(r) in your life. Skip and Dana are animal lovers dedicated to building a bridge between humans and animals through music. They create music exclusively about, for and with animals — dogs in particular. Plus, they are probably the only record label in the world that uses intuitive animal communicators to act as translators for the animals whenever we can involve them directly in the musical process. Each CD produced by the LAUREL CANYON ANIMAL COMPANY is devoted to a particular kind of animal or species. Each track is devoted to a particular concern, situation or shared experience of the people who love those animals or the animals themselves.. The LAUREL CANYON ANIMAL COMPANY utilizes the writing, production and conceptual talents of animal loving writers, producers, artists, communicators, animators, musicians, poets –and of course, animals from all over the world. Before we go, we dogs want to update you on our people and the Pet Food Recalls we posted about last month, along with tell you about another danger we recently learned about with spot-on flea preventive. Our parents are hard at work behind the scenes with Wendy working on her next book, "A Dog's Voyage Around the World" while Amber is finishing up the Family Disaster Dog Training Manual. Both will be available soon, woof, woof, we are so excited! All us dogs at Barking Bar Productions wish everyone a nice and safe summer of dog parks and beach walks. Here are the Latest Pet Product Recalls and Updates of poisoning and adverse reactions to products and food produced by Diamond, Hartz and Sergeants. Diamond Pet Food has been in the news for several months and is now facing a class action law suit. News stories airing on local television newscasts in select cities across the country are misleading and causing undue alarm with pet owners. As a result of a CDC report issued recently, media outlets are airing reports that position the May 4, 2012 recall as currently taking place. Some outlets are also linking all 49 illnesses to Diamond Pet Foods products. However, the CDC has indicated there were only 11 individuals who reported coming in contact with pet food produced by Diamond Pet Foods. This number has not changed since the original CDC report was issued in June. There is no new recall. That is all we know at this time concerning Diamond Pet Food. Hartz Flea and Tick Preventive is applied on the shoulders and back of animals and is causing extreme adverse reactions in many pets, espically cats who can be hypersenitive to chemicals applied to their skin. Cats also groom themselves more throughly then dogs do which in turn can lead to a cat ingesting more of the ingredients then dogs would. Unaware of the dangers, one of our family's cats was treated with Hartz flea and tick top spot two months ago and within a hour, the cat was licking and cleaning itself more then usual. After noticing the unusual licking we discussed the possibilty of the cat licking an excessive amount of the flea preventive and if this would make the cat sick. We decided Hartz was a safe and a well known company, and this product should be safe because the product was sold for this purpose and the directions had been followed. Well, our cat has not been seen since. He went outside the following day and disappeared. Many animals will seek out hiding places when they are sick leaving us owners guessing what has happened to them. When our cat didn’t come home, my daughter went online and found this site HartzVictums and shared it with us to share with other pet owners to be aware of the dangers of using Hartz Flea and Tick Preventive. You can learn at HartzVictums that in 2009, the EPA announced it had noted a significant increase in adverse incidents from pet spot-on products. Over 44,000 incidents were reported in 2008 — a 53% increase over 2007. That sharp increase in adverse incidents prompted the EPA to launch a high-profile investigation of pet spot-on products in 2009. Recently released documents from the EPA reveal that the majority of adverse incidents reported in 2008 were from Sergeant’s cyphenothrin spot-on products, which were sold under the name Sergeant’s Gold Squeeze-On for Dogs, Sentry Pro XFC, and TriForce Canine Squeeze-On.